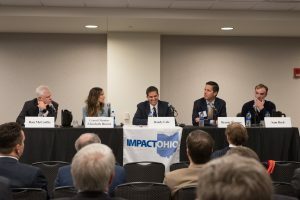 Blockchain was a topic of discussion at the 2018 Impact Ohio Post Election Conference. As Ohio paves the way for blockchain and cryptocurrency, it is important we understand the potential impact on the economy. The underlying technology behind Bitcoin and other cryptocurrencies is known as blockchain. Blockchain technology goes far beyond cryptocurrency and can be used for a variety of purposes. Former Governor Kasich signed legislation that enables the use of blockchain technology in Ohio. Senator Matt Dolan and Representative Ryan Smith are a few of blockchains legislative proponents leading the charge in making the use of blockchain for government purposes legitimate. Representative Smith compared blockchain to smartphones, claiming it will be rapidly and widely accepted in the coming years. Blockchain can be used to secure a variety of online records and offers a less costly, trackable, transparent, and more effective means of securing government databases. Blockchain technology is able to ensure privacy and strengthen cybersecurity in the age of an increasingly complex and expensive internet. Blockchain even has the potential to host an election making it a potentially influential tool in the public sector. At the Post Election Conference, Ohio business owner Bernie Moreno, President of Bernie Moreno Companies, stressed the importance of adopting new technology like Blockchain if Ohio hopes to become a center for technological advancement. Moreno says this will bring people back to Ohio and attract new tech-minded people. Ohio is also paving the way for cryptocurrency in the United States, becoming the first state to accept Bitcoin as a form of tax payment. Former Ohio Treasurer Josh Mandel introduced the idea of accepting digital cash as a way of broadening Ohio’s currency adoption and reducing transaction fees. The plan is rooted in a desire to give Ohio a more tech-friendly image. Mandel hopes other states will follow and there will be widespread adoption of not just Bitcoin, but other cryptocurrencies as well. States that have proposed similar bills have seen their measures stalled in legislature. However, Mandel claims the treasurers office can accept bitcoin regardless of legislative rulings. He would like to see this initiative at the federal level, allowing people to pay their federal taxes through cryptocurrency. Ohio’s decision to accept Bitcoin as tax payment is not as radical as it may sound. The State Treasurers Office will not be accepting bitcoin, but rather Ohio filers enter their tax information at OhioCrypto.com and send their cryptocurrency to BitPay, a payment processor, that will then convert them to dollars and return them to the office. The Ohio government will not be physically processing cryptocurrency or giving it a legal status. Bitcoin supporters claim recognition alone gives Bitcoin a perceived legitimacy which they have been lacking. Bitcoin is not yet broadly accepted as a form of payment and its opponents point to its use in criminal activity as a possible concern over its validity. The value of Bitcoin varies drastically from day to day, leading many to worry about its long-term sustainability as a form of payment. However, government approval gives it a sense of official acceptability which is reshaping public opinion of cryptocurrency. While we have no idea how many businesses plan on converting to cryptocurrency, it has the potential to attract start-ups and software engineers who are interested in paying taxes via Bitcoin. Newly elected Ohio Treasurer Robert Sprague has made no promise to continue the Bitcoin program while in office and will be closely viewing its effectiveness. Getting government officials and the general public on board with Blockchain is a significant barrier to its rapid adoption. Blockchain offers next level online security, but for anyone outside of the technological realm it is difficult to understand. Ohio officials might consider education on these new technologies as part of their implementation.